Back in May Vaughn Gittin Jr. previewed the 2013 Mustang RTR, and now he has officially revealed the car with new styling, new features, improved performance and up to 624 horsepower in Spec 2 form. Like the previous versions, the 2013 Mustang RTR takes the best of multiple automotive cultures and tastefully meshes them with the incredible 2013 Ford Mustang in the form of a dealer-installed package that is currently available in select Ford dealerships around the world. For the 2013 Mustang, RTR is stepping up its game in both appearance and performance, guaranteeing that RTR owners will get everything they desire out of their machine. RTR has landed on a very impressive suspension package utilizing Ford Racing adjustable shocks and springs, as well as 4-way adjustable RTR sway bars, RTR adjustable panhard bar, and RTR rear chassis brace – all of which utilize superior Whiteline bushings. This track-ready, street-friendly suspension package comes standard on a Spec 2 RTR or is available as an upgrade to all 2010 to 2013 Mustangs. A suspension set-up book will be included in the Spec 2 RTR to give the owner suggested combinations of chassis settings to match his or her interest – whether it is drifting, road racing, drag racing, long hauls, or just everyday cruising. Engine horsepower and torque gets an impressive boost of 25hp and 60ft lbs of torque at 1500 rpm’s by way of a Ford Racing Tune, K&N Air Filter, and RTR axle back exhaust system for the Spec 2. RTR has teamed up with Magnaflow Performance Exhaust to create a unique sounding exhaust system. This system successfully changed the “robotic” exhaust note of the 5.0 and contributed to a 9 horsepower gain on the dyno compared to the stock mufflers. RTR has also opted to change it up by using an innovative black ceramic coating on the mufflers that creates a high temperature thermal barrier, as well as adds to the aggressive look of the RTR. Another first in the Mustang market. The 2013 Mustang RTR appearance package includes the following upgrades: RTR chin spoiler; rocker splitters; RTR rear diffuser; aluminum RTR rear spoiler; RTR stripe kit; RTR badging; RTR rear deck lid applique; and 19 x 9.5 inch RTR wheels with Falken ultra high performance tires. RTR Spec 1 – Available for the V6 and V8, RTR appearance package (not including the rear diffuser, RTR rocker splitters, and deck lid applique. RTR striping is optional) Ford Racing 1.0 inch lowering spring, RTR axle back exhaust system. Spec 1 MSRP $6,250. RTR Spec 2 – Complete RTR appearance package, Ford Racing tune, Ford Racing adjustable shocks, 1.0 inch or 1.5 inch lowering springs, RTR 4-way adjustable front and rear sway bars, RTR adjustable panhard bar, RTR rear chassis brace, RTR axle back exhaust system. Spec 2 MSRP $11,995 (Optional 525HP or 624HP Ford Racing supercharger). Currently RTR is finalizing development of a “track slayer” package for release in August 2012 that will replace the panhard bar with a track-proven Watts Link as well as a few other suspension components to take the RTR’s handling to the next level for those wanting a bit more out on the track. The Mustang RTR is available only at select premium Ford Dealers world-wide as well as a few certified installation facilities around the USA. Check out MustangRTR.com to find your local dealer. 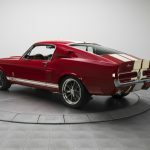 This entry was written by by MustangsDaily (Mustangs Daily) and posted here on Tuesday, July 17th, 2012 at 10:30 am and is filed under 2013 ford mustang rtr, 2013 mustang rtr, ford mustang rtrv, mustang rtr, News, RTR, vaughn gittin jr.. This article was not written by us, rather gathered using RSS feeds listed here. We take no credit for this article. You can leave a response, or trackback from your own site.